ATTENTION! From 23.04.16 to 31.08.16 HOTEL TAKES BOOKING ROOMS FOR THE "OUT OF THE OUTPUT DAY" (FROM FRIDAY TO SUNDAY). 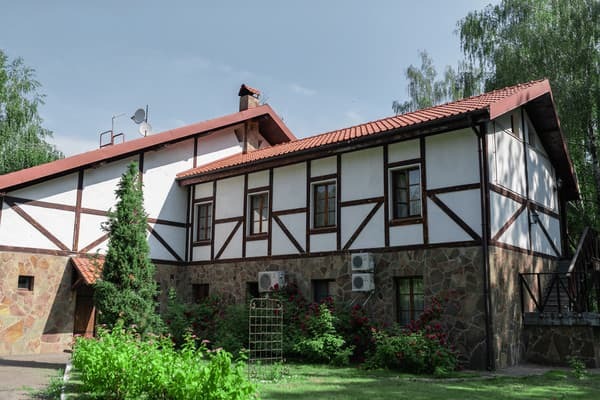 Sport Hotel Selena is a country complex located in the most beautiful corner of the Cherkasy region, in a picturesque forest right on the banks of the Dnieper. The territory of the complex is 14 hectares. Sport-hotel "Selena" is created for those who appreciate active rest, sports entertainments, comfort and beauty of wild nature. 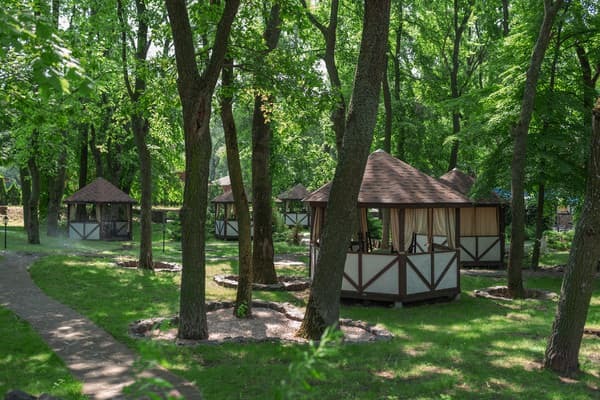 On the territory of the complex are two hotel buildings "Parus" and "Myslyvets", as well as 12 bungalows in various scenic spots of the park zone and the banks of the Dnieper. The hotel (hostel) is designed for drivers and guarding guests. There is a closed guarded territory, parking, free newspapers and magazines in the lobby, transfer, booking tickets (air, railway, buses, theaters and concerts), interpreter services, SPA services, medical services (on request) center (computer, DVD player, fax, copier, WI-FI), beach and pool, children's playground, two Russian baths, yacht club, rental of sports equipment, including bicycles and boats. On the territory of the "Selena" complex is the restaurant of the Kozyrnaya Karta "Khinkali", where delicious Georgian and European cuisine is served, and in the summer there is a beach bar near the pool. Distance to Cherkassy - 10 km. 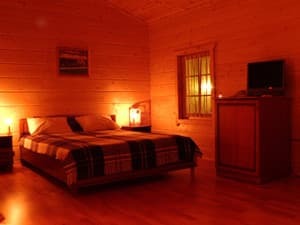 Description of the room: The interior of the room is decorated in the style of an alpine chalet. Comfortable single bed, a luggage stand. Windows face the hotel patio. Bathroom with shower. The room is located in the building of Parus (above the restaurant). The possibility of installing an extra bed or baby cot is agreed with the administration. Description of the room: Room with a large double or two single beds, a desk, a luggage cabinet. Interior in the style of the Alpine chalet. Bathroom with shower. Windows overlooking the park area, swimming pool and tennis courts. 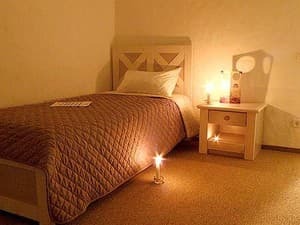 For a single accommodation, the price of the room is 690 UAH. 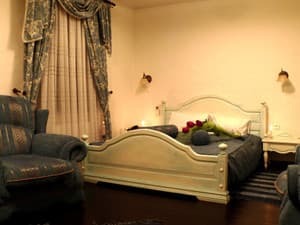 Description of the room: Romantic room in light blue tones with exclusive furniture, comfortable double bed, spacious wardrobe, dining table, dressing table, vintage curtains. Two windows face the hotel patio. Large bathroom with bathtub, shower and bidet. The room is located in the building Myslyvets (on the 2 nd floor). The size of the room allows you to put a baby cot or extra bed. 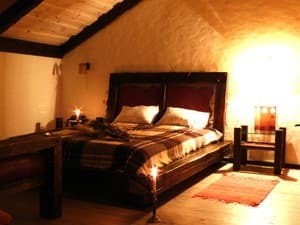 Description of the room: Room in the style of the hunting lodge, original oak furniture, large double bed with leather decoration, bedside ottoman, wolf skin on the armchair, dining table handmade, dressing table, wardrobe, luggage cabinet. Two windows overlooking the sky. Large bathroom with corner bath, shower and bidet. The room is located in the building Myslyvets (on the 2 nd floor). The size of the room allows you to put a baby cot or extra bed. 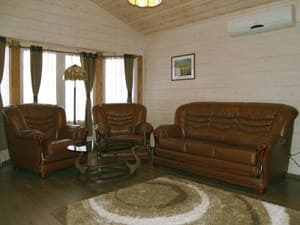 Description of the room: Comfortable room with an Alpine chalet-style interior, calm colors, comfortable upholstered furniture, double bed, chest of drawers. The room is ideal for a good rest. The room is located in the building of Parus (above the restaurant). The size of the room allows you to put a baby cot or extra bed. 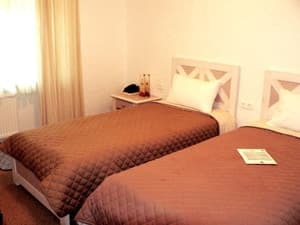 Description of the room: Comfortable junior suite in Art Deco style, comfortable upholstered furniture, double bed, sofa, lots of mirrors, comfortable corner bath, bidet. The room is located in the building Myslyvets (administration building). The size of the room allows you to arrange an extra bed (sofa bed with orthopedic mattress). Description of the room: Room with classic upholstered furniture, comfortable double bed and pull-out sofa. In the dining area there is a wooden table for 8-12 people. Large bathroom with shower. Veranda with a view of the Dnieper or a park area. The size of the room allows you to put a baby cot or extra bed. 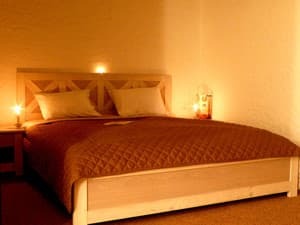 Description of the room: The room is made of wood with an interior in light, calm tones, a large double bed, a classic leather sofa, armchairs, a coffee table and a floor lamp. In the dining area there is a wooden table for 8-12 people. Spacious bathroom with shower (heated floor). Veranda with a view of the park area or the Dnieper. The house is ideal for families. The size of the room allows you to put a baby cot or extra bed. Холодно в номере. Предоставили обогреватель. Children under the age of 12 years stay free of charge and a continental breakfast is also provided (breakfast is not provided during low season). The cost of additional space is 200/250/300 UAH / day (depending on the season of residence). On the territory of the hotel complex, there is a restaurant of Georgian cuisine "Khinkali". 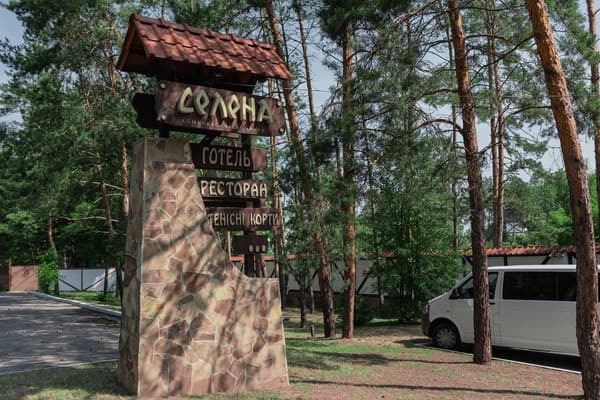 Sport Hotel "Selena" is located in the most beautiful untouched corner of the Cherkasy region, in a picturesque forest right on the banks of the Dnieper. The distance to the city of Cherkasy is 10 km. Club hotel "Selena" is located not far from Kiev. Two road routes are offered from Kiev to Cherkassy, ​​the same kilometers (185 km). The route through Boryspil-Pereyaslav-Zolotonosha is more rapid, but on the road a large number of traffic police. You also need to consider the "traffic jams" factor in the city of Boryspil. The route through Mironovka-Kaniv is characterized by a lesser traffic, but runs through a large number of settlements.